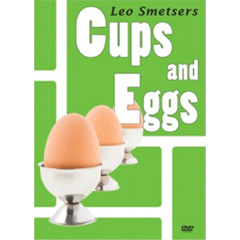 Cups and Egg's is a routine Leo developed to be fun, entertaining and have a kicker that made perfect sense. The Cups and Eggs routine uses ordinary looking props that everyone will recognise and is perfectly structured to give you a building routine with a great kicker! On the DVD Leo will teach you every move in detail to ensure you will be performing Cups and Eggs before you know it! Each Cups and Eggs Kit comes complete with everything you need to start performing straight out of the box!